Second in the series in the Laundry Room Reveal. Click here for the first post. 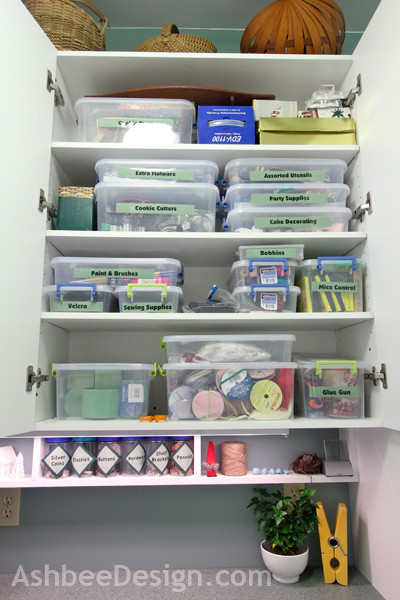 I knew I wanted all enclosed cabinets in this space - and as much as I could possible squeeze in. I know many people are opting for open shelving now and that is fine if your stuff is pretty but my laundry/pantry stuff is functional. It needs to be behind closed doors! I decided to work with a kitchen design center because there is little room for error. I have never ordered cabinets before and the expertise was appreciated. I brought in my floor plan indicating all the places I wanted cabinets and the Design Center East helped make that plan become a reality. I put in tons of cabinets! 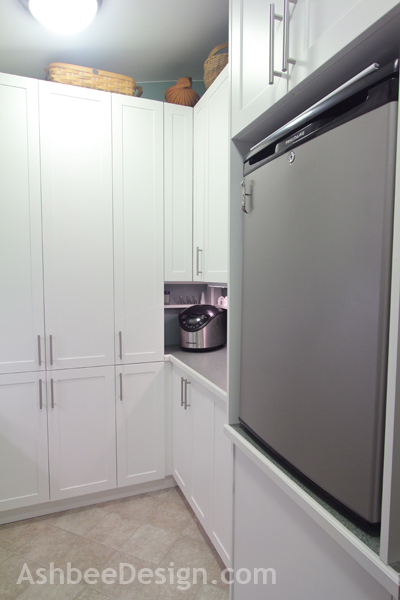 The line is Buyer's Choice in Quebec style cabinets with Pearl White finish. The clean shaker style is perfect for me and our house. 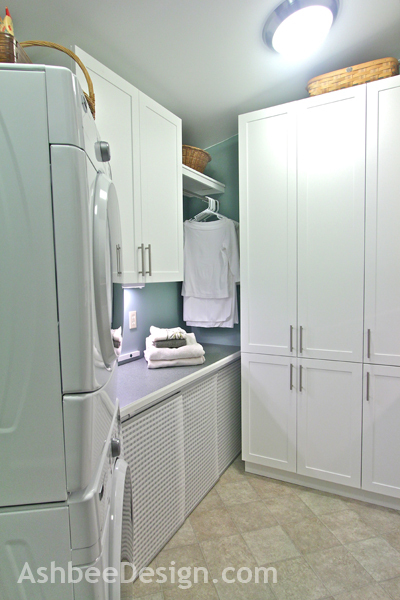 I decided to use laundry room grade cabinets - not kitchen grade because this is the laundry room! We settle on Buyer's Choice by combining my unique measurements with the options available from different lines. We knew many of the cabinets would be unusual sizes, but the cost could be kept lower if fewer were custom. The Design Center did the balancing act for me. In the end, I could get the most for my money with the Buyers Choice line. Here is the original plan put together by the Design Center. 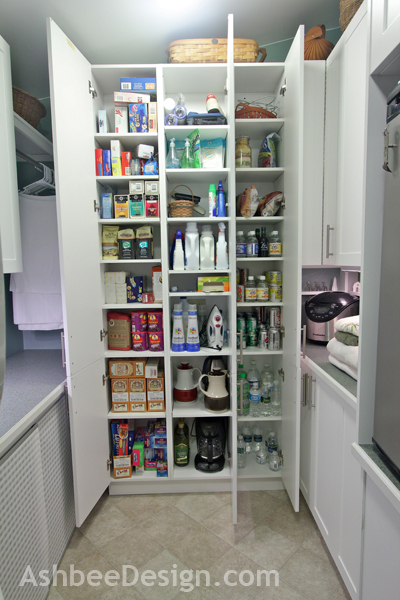 Cabinets with wide doors for larger items as well as pantry type cabinets. Counter tops for folding and to use when entertaining. This room is my "staging area" when I have gatherings and I needed more counter top space. Clothes folding countertop at a lower than normal height. I am 5'1" tall. My kitchen is at normal height. All my counters are 3" too high for me to comfortably work at. I decided here I would have one counter that was ideal! Space built in for a beverage fridge. Tall cabinets to maximize the cathedral ceiling in here. I don't mind using a stool. I have to all the time anyhow! Space above the cabinets for my basket collection. Ironing Board hidden in one of the cabinets. Roll out cabinet trolleys under the folding table. 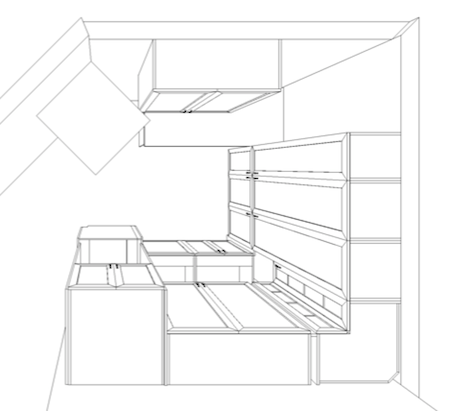 My idea was that because the folding table is lower, cabinets would have to be custom made. Instead, I'd build little trolleys on wheels with cabinet doors on the end. They would hold my laundry baskets. I could roll them out, and then roll them in again. Some things changed as we went along. Ironing Board cabinet. I didn't want to lose space in the center cabinet to have a fold out ironing board. We kept putting off that project and finally a better idea emerged (more to follow). Originally the recycling cabinet was going to be on top of the fridge but facing the room entry door. We were having problems with fitting it all using stock sizes. The recycling cabinet needed to be 24"deep and the option wasn't available for the raised location. Cindy, my design consultant, came up with the ideal solution on that one. She suggested we reverse the fridge and recycling cabinet, put the fridge at eye level, the cabinet below because there were more options in lower cabinets. Works beautifully. Looking in at my folding counter you can see large double cabinets overhead, the space conveniently left for hanging clothes, and the three tall pantry cabinets at the end of the room. 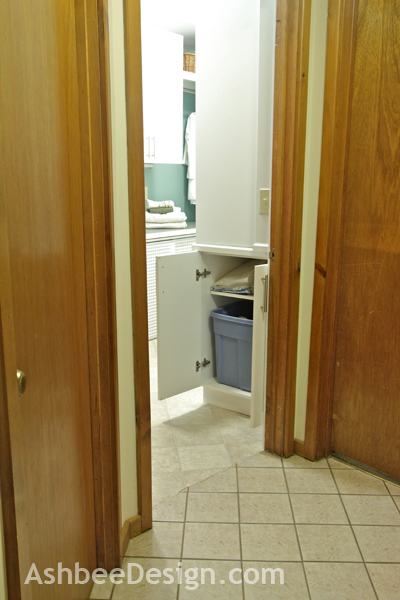 There is also large single door cabinets below and a generous deep cabinet above the fridge. Facing the door, just off the kitchen is the recycling closet. It fits a larger Rubbermaid tub perfectly so we fill it, and then take it out to the garage and bring in a replacement. There is paper recycling on the top shelf for junk mail and magazines as well. Do I have enough cabinets? For the time being, yes but as time passes.....probably not! I`v a small kitchen with white cabinets and white appliances. It makes and appear a little bigger and be a nice contrast for the oak floors. Get some cool handles and drawer pulls and it will look very chic. And I need to work on some artwork for the walls! I still have some big empty spaces that need a little decoration. I have ideas in mind though!